Well I had planned to have this first dungeon level completed weeks ago. That was before our second child arrived. As you might imagine, I’ve had my hands full ever since (quite literally), and couldn’t be happier. But I finally carved out some time to finish this. If you are just tuning in this is the first level of Hightop Dungeon. 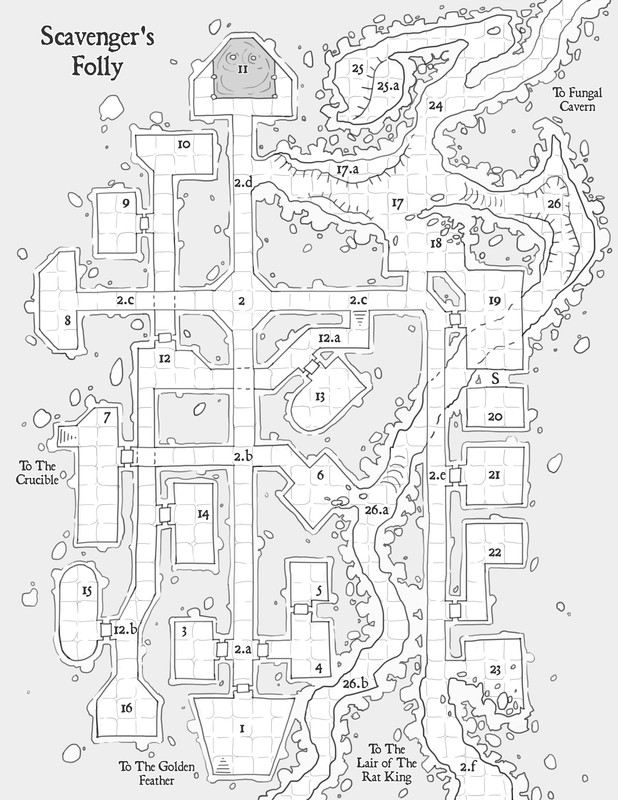 Scavengers Folly was the first level of Hightop dungeon to be discovered several years back as a result of Beldroved Grix’s fateful wine cellar excavation. Slightly over half of the eager adventures to first plunge into the dungeon’s mysterious depths never returned to the surface. Hence the name of this dungeon level. By all accounts Scavenger’s Folly appears to have once been the artisans ward of this crumbling Taldic dungeon complex. Delvers have uncovered a myriad assortment of tools, some of which even have known uses. Engineers, masons, sculptors, jewelers, smyths and mercers are among the many former residents of Scavenger’s Folly. Although much of Scavenger’s Folly has already been explored and looted, several times over, the ward nevertheless retains a few treasures. Many explorers have perished here and not all of their bones have been picked over. Some sturdy dungeon doors have remained stubbornly locked. And there’s at least one secret chamber yet to be discovered. The ward predominantly consists of workshops, dormitories and private residences. In addition there is a tavern, a large bath-chamber, a lavatory and some shrines, among other tings. Over the centuries giant vermin and erosion have added new corridors to the ward, connecting it to other levels of the complex. These tunnels are now used as a thoroughfare for scavenging vermin, kobold hunting parties and strange aberrations ascending from the dungeon’s ancient depths. A newly constructed stairwell in the ward’s southern chamber leads up to The Golden Feather Inn. An original stone stairwell in a western chamber descends down into The Crucible. Heading south along the cavernous corridors leads to the Lair of the Rat King. Heading north along these corridors leads to the Fungal Cavern. That about wraps up the first level. I’ll continue working on subsequent levels and posting them as time allows. I’ll also be posting some other RPG and map related content in the weeks ahead. Cheers.